Astronomers have discovered eight new planets in the so-called "Goldilocks" habitable zone, orbiting at a distance where liquid water, and possibly life, can exist. 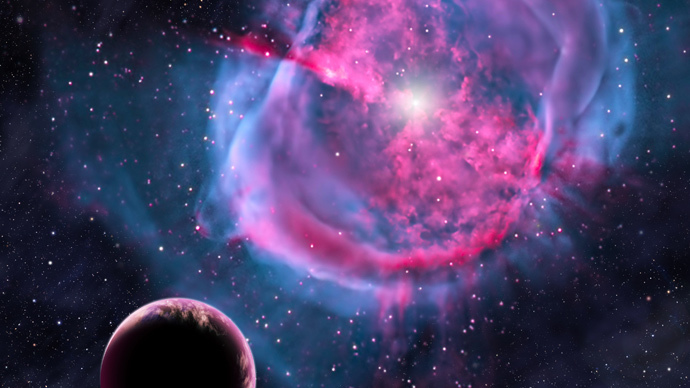 Two planets are said to be the most similar to Earth of any known exoplanets to date. "Most of these planets have a good chance of being rocky, like Earth," Guillermo Torres, the lead scientist from the Harvard-Smithsonian Center for Astrophysics (CfA) in Cambridge, US, told a meeting of the American Astronomical Society in Seattle. According to the astronomers, the two most Earth-like planets of the group are called Kepler-438b and Kepler-442b. Both orbit red dwarf stars that are smaller and cooler than the Sun. Their daily routine is as follows: Kepler-438b circles its star every 35 days, while Kepler-442b completes one orbit every 112 days. According to the scientists' calculations, with a diameter just 12 percent bigger than Earth, Kepler-438b boasts a 70-percent chance of being rocky. Its closest rival, Kepler-442b, is about one-third larger than Earth, but still has a 60-percent chance of being rocky. To be in the habitable zone, an exoplanet must receive about as much sunlight as Earth. Too much and any water would boil away as steam, while too little means it will freeze solid, scientists explain. "For our calculations we chose to adopt the broadest possible limits that can plausibly lead to suitable conditions for life," Torres said. Kepler-438b gets about 40 percent more light than Earth. To compare, Venus, the second planet from the sun, gets twice as much solar radiation as Earth. So, the team believes, Kepler-438b enjoys a 70 percent probability of being in the habitable zone of its star. Kepler-442b gets about two-thirds as much light as Earth. The scientists give the champion a 97 percent chance of being in the habitable zone. Although the scientists admit they don't know for sure whether any of the planets in their sample are "truly habitable," they are being referred to as "promising candidates." The paper reporting the research in detail has been published in The Astrophysical Journal. Prior to the latest discovery, the two most Earth-like planets known were Kepler-186f, which is 1.1 times the size of Earth and reaps 32 percent as much light, and Kepler-62f, 1.4 times the size of Earth, which gains 41 percent as much light. The latest discoveries were made with the help of NASA’s trailblazing Kepler Space Telescope, which was launched to hunt for Earth-sized planets outside the solar system. Since 2009, astronomers have discovered hundreds of exoplanets through the telescope alone; most of them are believed to be planets ranging between the size of Earth and Neptune (which itself is four times the size of Earth). As with many Kepler discoveries, the newly found planets are distant enough to make additional observations strenuous. Kepler-438b is 470 light years from Earth, while Kepler-442b is 1,100 light years away. Since the planets were too small to be confirmed by measuring their masses, scientists said they used a computer program called Blender to determine that they are statistically likely to be planets. The same method has been used previously to "validate some of Kepler’s most iconic finds, including the first two Earth-size planets around a sun-like star and the first exoplanet smaller than Mercury."